Designed for people who breathe with their mouths open while sleeping. The ComfortFusion mask combines our years of mask design experience with our understanding of your patients' needs - and your business. It meets those needs with the features you want most, including a reliable seal, an easy fit and a replaceable cushion. And our new FitPack™ comes with both a small and a medium cushion, enabling you to fit 90% of your patients right away - offering the value that youï¿½re always looking for. 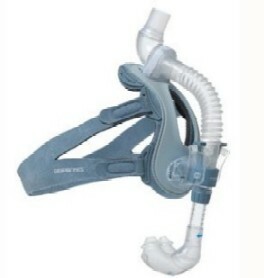 The Respironcs ComfortClassic Nasal Mask is a solid performer with it's 2 gel spacer positions and contoured design. 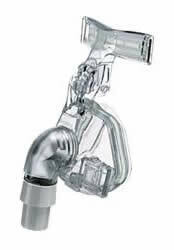 The ComfortFull sits lower on the nose, eliminating pressure. 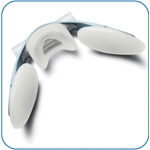 Its dual-layer cushion offers a great combination of comfort and stability for patients that mouth breathe. Our StabilitySelector™ helps the ComfortFull adjust easily and provide a comfortable, secure fit. The ComfortGel Nasal Mask brings a premium level of fit and comfort to the Comfort Series. An exciting approach to fully customizable gel masks combines proven comfort features with a host of new innovations. The changes to the ComfortGel help the mask fit better than ever, and that helps to improve compliance. It's yet another way that the Comfort Series helps fit 100% of patients 100% of the time. The ComfortLite 2 offers a host of features to help fit a wide range of patients looking for an increased chance at comfort and compliance. There are now three nasal interface offerings – the NEW Pillows Cushion, the Simple Cushion™ and the Direct Seal™ - giving patients a more personalized choice for their most comfortable and effective interface. The new “Halo” Headgear keeps the straps off the face and relies on the forehead for stability which provides a comfortable, reliable seal with no pressure points. This newly designed headgear features straps that are made from a flexible, sleep-friendly fabric and can be configured three ways. The crown swivel is made of a new, easy-rotating material – and it’s been moved forward to reduce contact with the patient’s bed pillow. This combination of features and personal options may be just right for patients who’ve been searching for a lightweight mask that offers an increased chance at comfort and in turn, compliance. 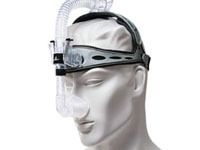 The ComfortSelect Nasal Mask brings a premium level of fit and comfort to the Comfort Series. An exciting approach to fully customizable gel masks combines proven comfort features with a host of new innovations. The changes to the ComfortGel help the mask fit better than ever, and that helps to improve compliance. With Material Filter or Maintenance Free This advanced air diffuser system prevents air from blowing onto the sleeping partner and decreases noise that could potentially disrupt sleep. Simply pull the Easy-Release Strap for one-step removal of headgear. No ongoing headgear adjustments required. 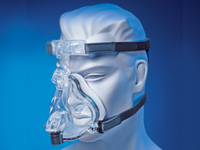 Comfort is inherent in the design of the Invacare Twilight Mask (patents pending). Created with extensive patient input, the Twilight Mask offers innovative features that have made it preferred by patients. Nasal pillows rest comfortably at the entrance of the nostrils. eather-light at 2.5 oz. Multiple tube positions for greater choice in sleeping positions. Soft and secure headgear provides comfort and stability. Fisher & Paykel Healthcare work for you today! Not only is the Profile™ Lite a comfortable off-the-shelf mask, it's also a fully customizable mask. The simple, 10-minute customization process molds the mask to the individual's facial contours for a personalized seal. 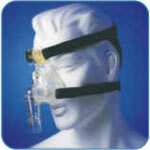 Your patients can easily customize the mask on their own, repeating the process as needed, to find the perfect fit. A personalized seal and a better fit means fewer visits and improvedoperating costs for you. 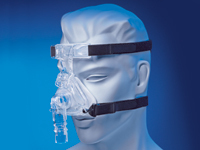 A full face mask offers a comfortable alternative to a nasal mask and can provide effective treatment for patients with sleep-disordered breathing, specifically, obstructive sleep apnea (OSA) and respiratory insufficiency. 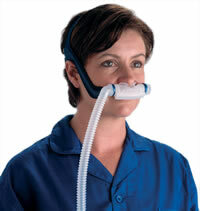 A full face mask can improve the sleep quality of patients who experience mouth leak during nasal ventilation. Mouth leak causes reduced sleep quality, sleep fragmentation, and decreased sleep efficiency which may ultimately affect patient compliance. Alternative techniques used to reduce mouth leak such as chin restraints can be uncomfortable and ineffective for some patients. 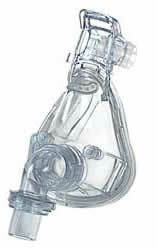 The Ultra Mirage mask system is specifically designed to meet the needs of both patients and providers. The simplicity of the design minimizes fitting time and reduces follow-up calls, rewarding your patients with long nights of quiet, comfortable therapy and the first step toward therapeutic compliance. 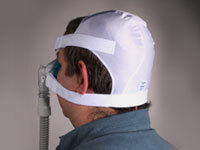 ComfortSelect offers a personalized fit that makes it an ideal mask for a wide range of people. It's benefits like these that help make compliance easy to come by. The ComfortSelect, like all masks in the Comfort Series, is latex free.